The global pressure sensitive labels market has made rapid progress in recent years thanks to the growth of the global retail sector and the food and beverage industry, which have become dominant consumers for the pressure sensitive labels market. Pressure sensitive labels, also called adhesive-backed labels, are used in a wide variety of applications due to their ease of use and the ease they provide in incorporating other technologies such as barcodes into their design, which makes them easy to incorporate into the day-to-day functioning of industries. The ease of incorporating branding material in the design of pressure sensitive labels has also driven their adoption in various sectors and is likely to remain a key driver for the global market in the coming years. The global pressure sensitive labels market was valued at US$86.8 bn in 2017. According to Transparency Market Research, the global pressure sensitive labels market is likely to exhibit a 5.2% CAGR over the 2017-2022 forecast period and emerge with a valuation of US$112 bn by 2022. One of the major drivers for the global pressure sensitive labels market is the steady growth of the logistics sector in recent years, as well as the rapid subsequent growth of the transportation industry. Logistics has become vital due to the growing adoption of long-distance shipping chains and the need to multiply sales outlets. The pressure sensitive labels market has gained significantly from this trend due to the ease of applying pressure sensitive labels and garner consumer interest. The ease of delivering product information in an attractive format is likely to drive demand for pressure sensitive labels from the logistics and transportation sector in the coming years. Growth of the food and beverage industry is likely to be vital for the pressure sensitive labels market. The growing use of food packaging technology in order to facilitate long-distance shipping has made pressure sensitive labels absolutely vital to the food and beverage sector, as they provide the means to incorporate product information, regulatory information, as well as identification data such as barcodes on packaged food. Of the various materials used to produce pressure sensitive labels, paper is likely to remain in demand over the coming years due to the convenience of printing paper sheets in various designs. Paper accounted for 42.7% of the global pressure sensitive labels market in 2017, with the segment valued at more than US$37 bn. According to Transparency Market Research, the paper pressure sensitive labels market is likely to exhibit a strong 4.7% CAGR in the 2017-2022 forecast period to rise to a valuation of US$46.6 bn. Geographically, the global pressure sensitive labels market is likely to be dominated by demand from emerging economies in Southeast Asia. Countries such as China, India, South Korea, Malaysia, Indonesia, and Taiwan, where urban development is being carried out at a rapid rate and the local economy is subsequently expanding at robust rates, the pressure sensitive labels industry is likely to be boosted by the growing demand for transportation options. The growing retail sector in these countries, thanks to the rising disposable income of consumers in this region, is also likely to lead to a rise in the demand from the pressure sensitive labels market in Asia Pacific except Japan. APEJ accounted for 33.5% of the global pressure sensitive labels market in 2017 and is likely to consistently remain a leading contributor over the 2017-2022 forecast period. 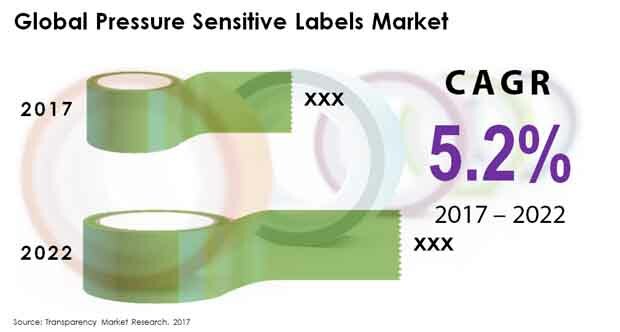 Major players in the global pressure sensitive labels market include Avery Dennison Corporation, Henkel, CCL Label Inc., Lintec, Constantia Flexibles Group GmbH, Coveris Holdings SA, 3M, Inland Labels, Fuji Seal International, Inc., and UPM-Raflatac. In 2017, the global pressure sensitive labels market reached an evaluation of US$86.8 bn, reports Transparency Market Research. The market is expected to grow at a healthy CAGR of 5.2% during 2017-22. The global pressure sensitive labels market is likely to reach US$112 bn by the end of forecast period. The main players in the global pressure sensitive labels market cater to numerous industries including food and beverage, pharmaceuticals, transportation and logistics, home and personal care, semiconductor and electronics, and retail. The market players also uses various materials to create pressure sensitive labels, also known as self-adhesive labels. These materials usually include paper, polypropylene, polyethylene, and PET. The report on global pressure sensitive labels market aims to narrate the key trends and future opportunities. It includes perceptive analysis of information regarding growth opportunities and leading challenges. Thorough analysis on fundamental competitive threat is a vital part of the global pressure sensitive labels market report. Growing demand in the food and beverage industry has emerged as a boon for the pressure sensitive labels market. Increasing consumer demand towards ready-to-cook meals and organic foods, rising automation in storage facilities, and rising consumer awareness is driving the growth of attractive as well as transparent labeling. Labelling for alcoholic beverages is also expected to open considerable opportunities. Pressure sensitive labels have always played an important role in advertising alcoholic and non-alcoholic beverages. Self-adhesive labels differentiate products, establish brand identity, and also heighten the thirst for a particular drink with added animation. Additionally, current government regulations require beverage manufacturers to recycle almost all PET and glass bottles. This development is likely to drive growth of synthetic self-adhesives labels. These labels provide robust adhesive qualities, but can also come off easily to improve manufacturing efficiency. Moreover, advancements in printing and digital technology is resulting in various product innovations and enhancements. Current labels offer various qualities for promotion strategy such as subtle & high-gloss metallic, specialty varnishes, micro motion, specialty substrates, and high-definition printing as well. These advancements are likely to extend revenue margins and result in considerable growth for the pressure sensitive labels market. The pressure sensitive labels market is witnessing a few challenges as well. Economic difficulties in the retail sector are expected to spill-over. Additionally, digital labelling promises a more robust mechanisms for the increasingly price-sensitive competition. However, as consumers shift towards e-commerce, labelling for storage facilities is expected to go up considerably. The pressure sensitive labels market report will provide information about all main regions including North America, Europe, Asia Pacific, Latin America, Middle East and Africa. Asia Pacific is likely to register the fastest growth in the pressure sensitive market during the forecast period. The region is undergoing major infrastructure developments, which is resulting in increased manufacturing activity, and growing disposable incomes. Rise in public infrastructure initiatives are expected to boost the transportation and medical sector. These two industries are among key users of products from the pressure sensitive labels market. Additionally, while North America and Europe are witnessing a decline in the retail sector, Asia Pacific is witnessing a tremendous growth in this sector. This is expected to drive significant opportunities for market players in the pressure sensitive labels market. Some of the key players in the pressure sensitive labels market are Henkel, Lintec, Avery Dennison Corporation, CCL Label Inc., Coveris Holdings SA, and Constantia Flexibles Group GmbH.